The rising popularity of sous vide machines can be attributed to their endorsement by celebrity chefs who feature them on television shows. People have become more experimental and willing to adopt the techniques used by well-known chefs. 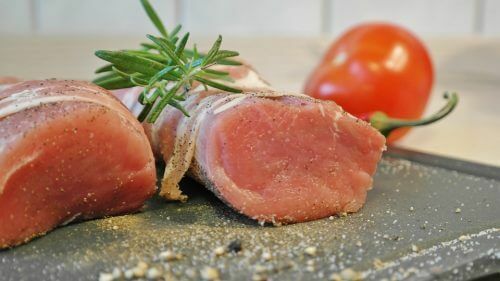 A sous vide machine allows one to cook meals at low temperatures in such a way that its moisture and flavor are retained. Similarly, the food cooked using this method retains its nutritional value, thus making it a healthier cooking option. In contrast to many methods of slow cooking that leaves your food dry, tough and tasteless, this cooking method is quite the opposite and overcomes these downsides. If sous vide is a method that you may wish to try to diversify your culinary skills, then you need to purchase an appliance designed specifically for this purpose.However, there is a wide range of different brands on the market and choosing the best sous vide machine is often confusing. Each product boast to be the best and has different features, and it might be hard to differentiate the wheat from the chaff. The technical jargons employed by manufacturers of sous vide machine may baffle you and leave you undecided on the right choice. Here, we will help you choose the right sous vide machine by reviewing the top-rated and best sous vide machine. Our review will be followed by a buyer’s guide to sous vide machines highlighting the factors to consider when buying these machines as well the benefits of having this appliance in your kitchen. Time for the real business now; reviewing the top 8 best sous vide machines on the market. The ChefSteps Joule is one of the best sous vide machines. It has an elegant design with a sleek, minimalistic style. It is one of the best product made by ChefSteps, a company well known for offering instructional cooking content. Their expertise is apparent in this appliance, which is operated exclusively via iPhone or Android app; there are no control buttons on this unit. The app has a simple and attractive design which is nearly flawless. The tradeoff of lack of physical control may be worth it as the device fit comfortably in any kitchen design as it has a compact and all-smooth design. It heats the water quickly and doesn’t stray too far from the inputted temperature. 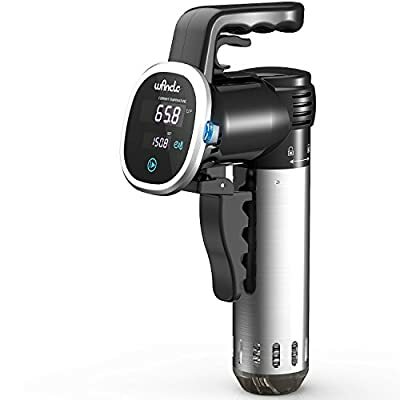 If you don’t mind cooking using an app, then ChefSteps Joule Sous Vide is a great way to learn about this cooking method that has grown in popularity in the recent past. The Anova precision cooker helps you bring the sous vide cooking to your home. As its name indicates, you can control this cooker using Bluetooth connectivity, even if you are not in the kitchen. Its Bluetooth coverage offers a range of three feet. Anova has an app allowing you gain access to the machine. This feature allows one to carry other tasks while cooking making it a convenient appliance that does help free up your time. In addition to this, its app monitors the food you are cooking without getting it overcooked. It issues a notification telling you the cooking process is over. With this app, you can enjoy a lot of features such as 1000 recipes you can try, guided cooking, recipe sharing, cooking notifications, and video tutorials to help take your cooking game to another level. This precision cooker ensures your food is cooked to goodness by spreading temperature evenly with its head. Cooking is an art, and when done the right way, it can up lift even the sourest of moods. To do it the right way, you have to understand all the factors that play a part in ensuring the ingredients produce their optimal taste and flavor. This sou vide machine from Gourmia does exactly that using immersion cooking method. 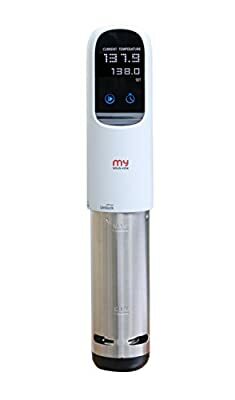 Whether you want to learn how to cook or you are a seasoned chef, Gourmia GSV130 Sous Vide Machine will offer an easy, reliable way to make your crisp vegetables while retaining nutrients and bringing out the best in your tender cuts of meat. 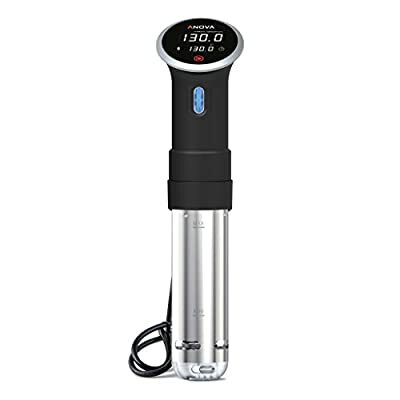 This immersion circulator precision cooker from Gourmia introduces one to sous vide cooking. It comes with a recipe booklet where you can find a wide variety of recipes that you can cook using this appliance. Its control panel is quite easy to use; it has a one-touch power button that switches it on and off. You can set your unit’s temperature by pressing the set button and power button together. You can adjust temperature and time by rotating the wheel and then press the set button to record your desired setting. This sous vide machine provides precise water circulation and even heat to give out a perfectly flavorful, tasty, and well-textured food. Its touchscreen panel has full LCD and the few buttons provide you with peace of mind. Besides the convenient active controls, this appliance self-regulates the water temperature. Therefore, all the foods you are immersing comes out evenly cooked. It can cook steaks, eggs, vegetables, pork, fruits, etc. This is among the best sous vide machines. One thing that sets it apart from its competitors is the strong grasp on its clamp. This is critical, because if the clamp slides, you will have uneven cooking, which defeats the core purpose of sous vide machines altogether. Besides, this device fits most pots and thus you won’t likely have to go out and purchase a special pot for it. This makes it a real money-saver. It maintains a reliable temperature with a variance of only one degree Fahrenheit. Temperature is an important aspect of sous vide. For soft dishes, a temperature off by just more than one degrees Fahrenheit could ruin your meal. In most immersion calculators reviews, you will find consumers complain about their devices having inaccurate temperatures, but this is not the case with Kitchen Gizmo Sous Vide. This device is ETL approved, meaning it has met North American safety standards. Besides, it has a safety feature that activates itself when submerged in water above the required amount. Its touchscreen control is also cool; you can use it to switch between Celsius and Fahrenheit with ease. It also alerts you to any errors, and thus you will know immediately if there is an issue with the machine. 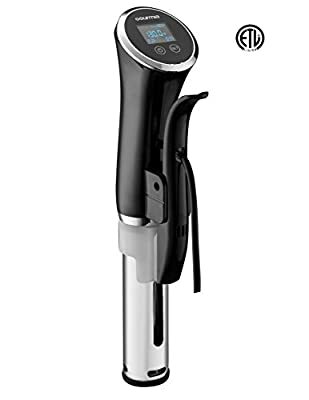 The Kitchen Gizmo Sous Vide has a stainless-steel sleeve and rubber-coated handle, making it easy to clean. There is nothing worse than a complicated-to-clean appliance. On top of all these features, its manufacturers offer a cookbook. If you are new to sous vide, this book will provide extra instructions. 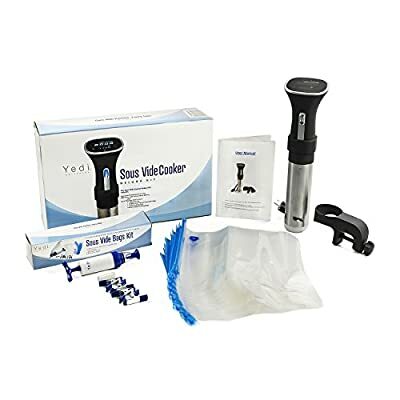 The YEDI HOUSEWARE Sous Vide is incredibly easy to use. You can use this appliance to achieve excellent cooking results at home. It heats and circulates water uniformly resulting in cooking food evenly. It also has a digital touch screen that helps you control a temperature range and cooking time. Its timer allows for 99 hours and 59 minutes while its temperature can range from 41 degrees Fahrenheit to 212 degrees Fahrenheit. It comes with all the accessories you need to cook a wide range of meals including a hand pump, 10 FDA certified vacuum sealed bags that are BPA free and reusable, one vacuum bag sealing staple, and four container clips. 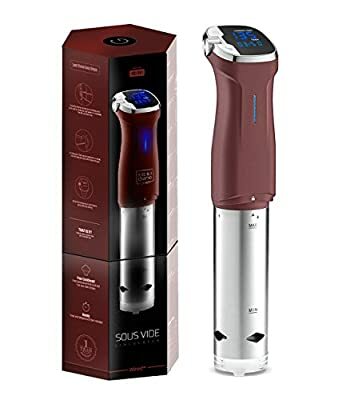 It is a great sous vide machine for beginners as it comes with a detailed instruction booklet to help you learn how to use this appliance as well as a free starter recipe book to help you enjoy a diverse variety of meals. With a two-year warranty and a full refund policy, you can be assured that this is a durable appliance. Made of food-grade stainless steel, you can use this appliance with utmost confidence that it cannot overheat. It also has a low water level protection, eco-friendly feature, and maximum line indicator. 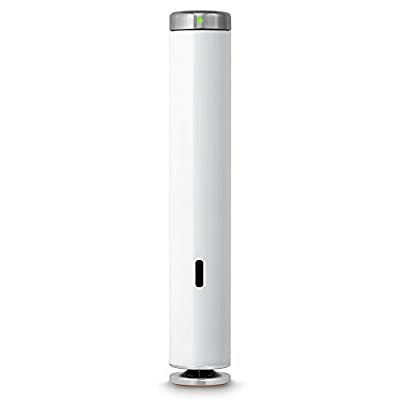 This is another great sous vide device that perfectly cooks food and helps it preserve all its nutrients and vitamins. Professional chefs and restaurants have been relying on this immersion calculator for more than a decade. It comes with a digital touchscreen control panel that has a precise 0.1 degrees Celsius with matching time in minutes. Its temperature controls range between 77-211.8 degrees Fahrenheit or 25 -99.9 degrees Celsius. This ensures precise, safe cooking. 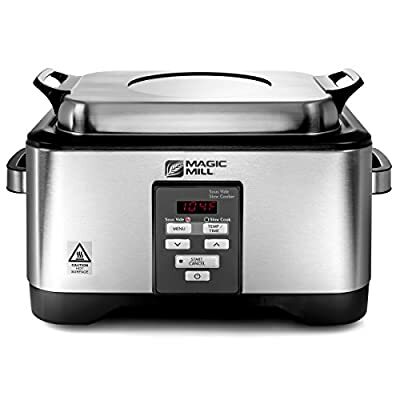 This device has a maximum cooking time of 99 hours and 59 minutes. With Wancle Sous Vide Cooker, your food will retain its vitamins, nutrients, and juices. This precision cooker guarantee even cooking; place all your ingredients in a glass jar or vacuum sealed bag, drop it into the water, and this appliance will do the rest of the work. It comes with an attractive design that is approved by most restaurants. Its design prevents overheating, prevents mist from building up in its control panel, and provides protection against minimal water levels. The locking clip comes with a trigger making it easy to tighten and remove within seconds. Also, the locking lid is adjustable and can fit in different pot sizes. When cooking, Wancle Sous Vide Cooker does not make any noise. This appliance is easy to clean and dry as it has a stainless steel sleeve that can be detached. It comes with a one-year warranty. If you are a bad cook and you have always been a calamity in the kitchen, Magic Mill Sous Vide Water Bath can turn that around and save your reputation. It cooks food at precise, consistent temperatures; overcooked or burnt food will be a thing of the past. This sous vide machine will help you learn a world-renowned culinary technique that proved difficult for anyone in the past. With this machine, you can vacuum seal food and cook at precise temperatures for long periods. It can cook any type of food; from succulent salsa and hollandaise sauce to spicy chutney. 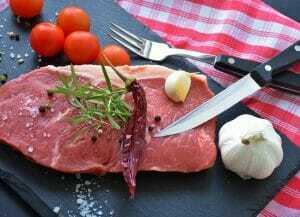 You can also prepare a steak other foods that you want to retain succulent nature. You can also turn fruits into coulis and compotes in this water bath. With slow cooker settings, you can prepare meals easily. This will help them retain their moisture and delicious flavor that would otherwise be lost if you warmed your food using a microwave. The slow cooker mode can be set to cook your food at a certain time automatically, so you will find your dinner ready in the evening. The Magic Mill Sous Vide Water Bath has 6-quart non-stick basin that is removable for ease of cleaning. This means no more pots or grill pans to scrub. You can use this sous vide machine for both fast and slow cooking with great results. This appliance can also be used to cook a diverse number of meals since it has a wide temperature range. Cleaning it is also very easy since it has a detachable cover. The cover is also very steady as it’s made of stainless steel. If you prefer cooking at certain timings and temperatures, then this machine features an LCD interface allowing you to input your preferred settings. However, you cannot control it remotely as it lacks wireless connection capabilities. 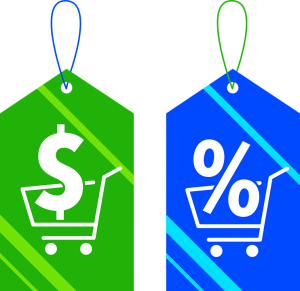 For many people, price is the deciding factor because of their limited budget range. Of course, there is a significant difference between cheap and expensive sous vide machines. Our advice is if you are unlikely to use this appliance on a regular basis, then go for a less expensive one. On the other hand, if you intend to use your sous vide machine on a regular basis, or you want one with professional capacity, then it is worth choosing a sizeable appliance that boasts advanced features and made by a reputable brand. Most sous vide machines have water capacity ranging from 5 and 20 liters. Larger appliances suit professional kitchens where large quantities of foods are cooked. Think about quantity and size of your meals when choosing the right machine for your needs. As a rule of thumb, pouches should only fill half the capacity of your water bath. The best sous vide machines have a temperature stability of 0.5 degrees. A temperature difference exceeding 0.5 degrees can make a significant difference in sous vide cooking. Check if the sous vide machine you choose comes with a water bath container since not all of them come with one. The included water bath containers have superior insulation over all other types of pots. There are other appliances that allow you cook with any cooking pot, such as immersion circulators. This determines the length of time it takes to heat water. When shopping for the best sous vide machine, it is important to think about your needs, which should include things like the number of people in your household, features you are searching for, and the nature of the unit; should it be a fixed capacity or portable unit? In the case, if you need an item that is more flexible in terms of travel and storage, you should consider buying a portable appliance. If you have ample storage space in your kitchen, you can go for a large, fixed-capacity sous vide machine. These are important issues you need to take up if you are in the market for a sous vide unit. It will help you pick the right appliance for your cooking needs. If you want an appliance that has fewer maintenance needs, choose a temperature-controlled water unit with a non-stick surface. They are easier to clean and maintain. It is recommended that you check the ratings and reviews of the units you are considering. You can find various sources for the ratings and reviews such as reputable review sites (like ours) as well as Amazon. There is a good chance that you will come across several negative immersion circulator reviews. However, it is important to look at the overall picture. If the vast majority of the product reviews are positive, then you are likely to have a positive experience with the appliance as well. You can ask people to help you out. If you know someone who uses this appliance, you can get an opinion from them. Look for an appliance with safety features such as an alarm that switches the unit off if the water pressure is too low as well as a protective shield that prevents your appliance from sticking to the boiler coil. These are the important factors to take up if you are in the market for a new sous vide unit. It will help you pick the right appliance for your cooking needs. 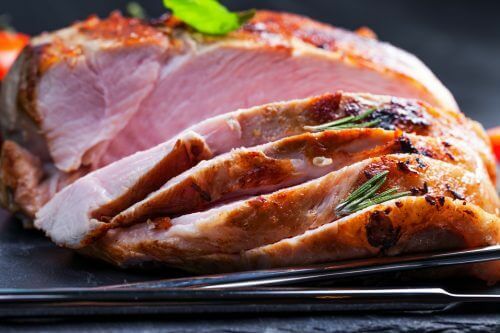 Because of the juicy, succulent results you get when you cook using a sous vide water circulator, you can choose cheaper cuts of meat that you might, otherwise, would have avoided. This saves you money without compromising on your cooking results. A sous vide machine cooks food slowly but at a constant temperature. The results you achieve are much guaranteed. Just check a recipe app or book for the “excellence” you want your chicken, fish, or piece of steak you want to achieve, place it into a cooking bag and your machine. Set its timer and you are off. Sear your fish or steak when it has finished cooking, and there you are- it is ready to be eaten. There is no hit or miss when it comes to cooking with a sous vide- the results are consistent time after time. People have varying tastes, and sometimes it is difficult to meet all the needs of family members. However, when you cook with a sous vide machine, you can place each piece of food in its individual bag which means each one can be cooked with a different mix of flavoring and specific cooking time. Therefore, it is longer matters how anyone wants the steak to cook or which spices and herbs someone does or does not like- with a sous vide machine; you will soon be catering like a pro. A sous vide machine frees most of your time since it is just a matter of throwing your foods into a bag, put them in the water, set the timer, then go off to whatever you want to do. No more getting stuck in the kitchen, checking to see whether your food is cooked yet, or hovering over the oven or grill. This is a time saver in the kitchen- you can even cook frozen foods. With a sous vide machine, cooking becomes easier and better. There are a lot of sous machines on the market and choosing the right one can be difficult. That’s why we offered our honest sous vide immersion circulator reviews. Each of the sous vide machines in our top eight list have their own qualities and features. Therefore, consider what you want from a sous vide machine and click to buy the appliance that meets your requirements. anovaculinary.com : What is Sous Vide Cooking? modernistcuisine.com : Why Cook Sous Vide?